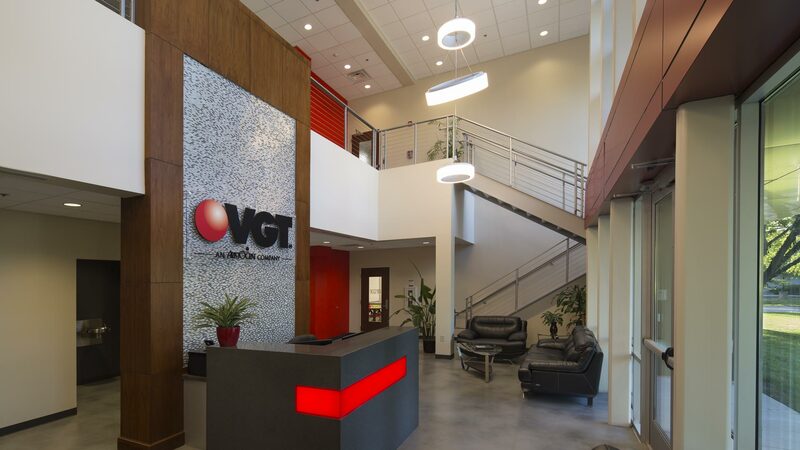 The project consisted of the phased renovation of an existing 67,400 square foot (SF) warehouse into office space for a new corporate headquarters for Video Gaming Technologies’ (VGT). A floor slab was added within the existing warehouse to provide a second floor area, which nearly doubled the usable square footage of the facility. The renovation and addition of the second floor slab provided 58,300 SF of office space, including 14,800 SF of major renovation to existing office space to create new open office suites. Approximately 23,900 SF of the original 67,400 SF footprint remain available for future expansion. Offices and conference rooms located near the center of the floor plate with open cubicles along the perimeter windows to maximize day-lighting of interior work areas. DIRTT glass walls and sliding doors in offices and conference rooms to capture daylight from the perimeter windows. Skylights in the center of the floor plate provide additional daylight above a new monumental stair providing an atrium-like space. Cubicles in open office space designed as various types of “pods” to accommodate VGT’s unique team concept, and oriented to capture daylight from the perimeter windows. Existing loading dock was transformed into a covered outdoor dining patio adjacent to the new cafeteria. A new covered staff entry was added on the west side of the property. New elevators, toilets and coffee bars were incorporated. Existing industrial-type metal wall panels were replaced with new aluminum composite panels and insulated storefront windows. New screen walls complementing the new wall panels were added on the roof to conceal mechanical units. Existing traditional HVAC system was replaced with a VRF (Variable Refrigerant Flow) system to provide individualized control for thermal comfort of building occupants. Additional site improvements include a new parking lot with LED light poles, a perimeter walking trail, a volleyball court, an emergency generator and a dumpster enclosure.